1. In a mixing bowl add all ingredients except chicken and whisk it well. 2. After washing your chicken, pat it dry. 3. Now poke chicken and put the chicken in zip lock bag or marinating bowl/tray. Pour the marinating mixture over the chicken. 4. Shake it well and let it sit for at least 2-4 hours. 5. Heat the grilled pan and grilled the chicken till golden brown on each side. Do not flip in between otherwise the meat will tear. 6. Whenever it is ready cool down before cutting into slices so that juices can run over and chicken will remain moist. 1. Dice all the vegetables in bite size pieces, not to small as they need to be roasted. 3. Mix all ingredients with garlic cloves and chopped rosemary, salt and pepper, grilled seasoning, olive oil. 4. In a roasting pan add these vegetables and roast them until golden brown. 1. In rice cooker add 1 tbsp of olive oil and add those vegetables. 2. Now add rice and roast them for 2 minutes before adding water. 3. Then add 1 cup of water and salt to taste to cook the rice. 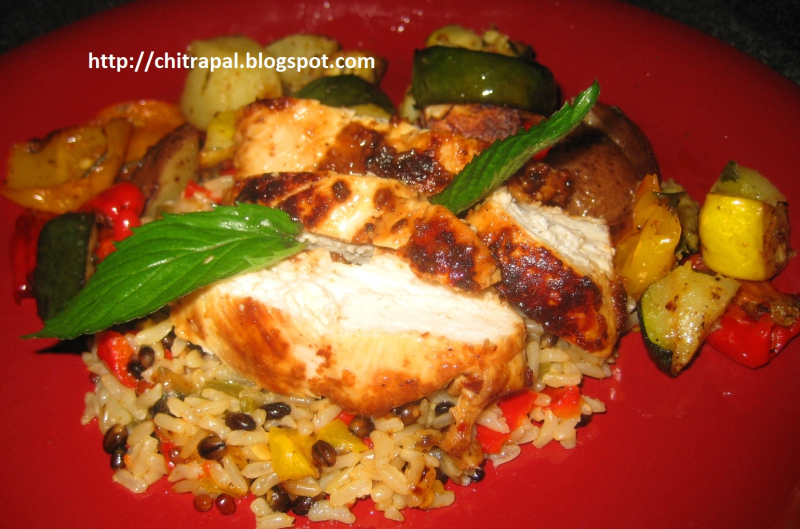 For serving the whole dish make a bed of rice and lay the grilled chicken slices on top. On the side serve roasted vegetables.